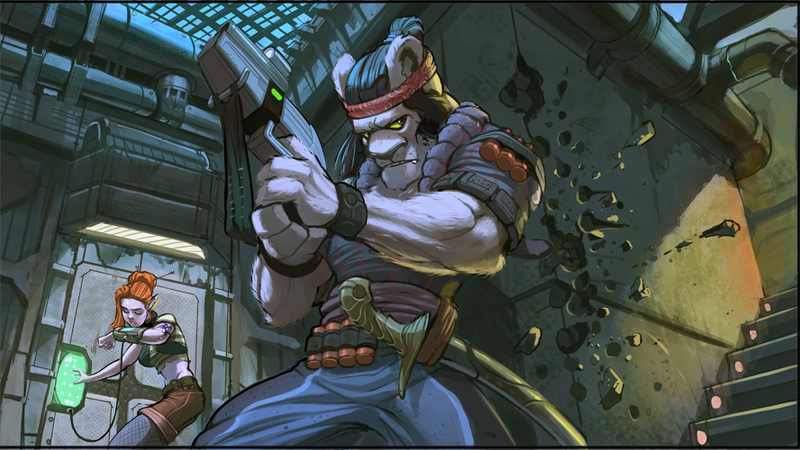 In 2007 I began working with a Canadian Artist on the Galaxy Pirates RPG project. Sketches and Artist’s renderings by Anthony Cournoyer, I asked Anthony if I could show some of the Work In Progress stuff to give people a behind the scenes view of the process and he agreed. The piece below is for the skills section of the book, it’s supposed to demonstrate our hacker trying to open a high security door while her partner the Katar Bounty Hunter plays lookout, some guards find them and a gunfight ensues. The Space Elf hacker and Katar already had established looks at this point, so the process was relatively straightforward, I’m going to try to write articles where decisions had to be made and maybe that will be useful to you. Initially Anthony gave me the sketches below. 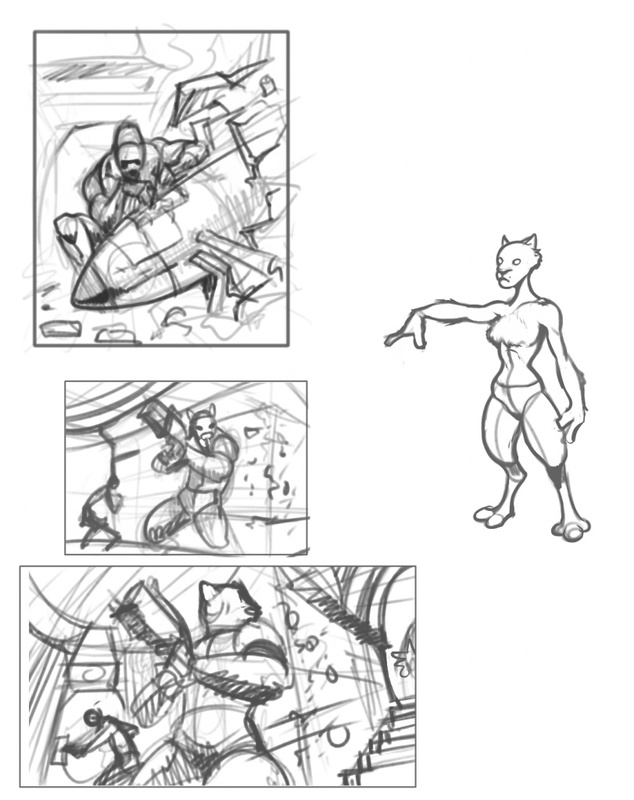 For those of you not familiar with the concept of thumbnail sketches, they are quick sketches that try to get the point across while not taking long to do and not going into very much detail. You work small on purpose, mistakes only get bigger when you blow them up. At this stage the client will pick his or her favorite and ask the artist to proceed. The four pictures here are One for someone disarming a bomb, one for a female Katar and 2 proposed ideas for the Lockpicking scene we’re talking about here. Even if its wrong a thumbnail sketch can tell you something important, it tells you what you don’t want. So the small Lockpicking sketch is really more about the guy standing guard and it might work great for a portion of the book talking about Combat and maybe how to use cover. But it doesn’t focus enough on the girl trying to hack the lock. Sketch two at the bottom is closer so I tell Anthony to run with that. So lets talk a little bit about a girl named Sabrina, Sabrina was Kate Jackson’s character on Charlie’s Angels, and over the course of the show they sometimes wanted to show Kate looking very determined and dangerous, so they bring the camera in close on her face and make sure to get her gun in the shot. It works great for Television, not so great for loaded weapons being used by real people. It looks okay here in the shot, but its just another thing some gun guy might see and say “what the hell?” so of course this shot isn’t going in the Combat section. Anthony comes back with this next shot, fleshes out the bulletholes in the wall, puts a grating over the hallway, does lighting on the steps and gets the colors set for the scene. Once that was approved Anthony worked in shots being fired and sparks coming off the walls from previous shots. If you look carefully at the grate above them you can see buildings in the city. He added a light fixture at the top of the stairs and there is more lighting coming into the frame from the right hand side. Some of the folks I tested out the image on early couldn’t tell where the corner of the wall was and thought the Katar was floating away from the wall, i.e. didn’t have his back against the wall as he was supposed to look. Also they thought it looked a little like the Cover of First Edition Shadowrun where the Hacker is breaking into an ATM machine or security console of somekind while two others fend off attackers. This is the finished piece for the Disable Device skill in the Core Book. If you just want to have a nice piece of artwork from an artist you like, I hope these articles help. You will want to think about the character the pose and maybe if you want a background. You will want to have pictures to show the artist and money in hand to pay for the job. If that’s all you want you can stop reading now. If you want to buy artwork for the RPG industry, keep reading. I didn’t make the same mistakes on this image as I did on the ones in the first or second article. -I ordered a piece of artwork for a project (the Galaxy Pirates core rulebook) knowing exactly how it was going to be used in a final product people hopefully will pay money for. That means the choices about size, and color or black and white had a relationship to the project budget. -I did have a project in mind, I still wasn’t certain how many pages it would be, which would tell me how many pieces of artwork I would need. I did know how many skills there were going to be and I wanted something for each of them to show the skill in action. -This time there -was- a project, but unlike lots of adventures and supplements, a Core Rulebook would still be hard to compare to other products available for pricing and sales information which means I don’t know how much money I might make back on it. -Which means there are still speculative risks involved with the project. I had a steady day job at the time and it was starting to dawn on me how expensive this thing just might get. If you want to make money in the RPG industry you need to think about this stuff too.